A chill is in the air, and we are getting so close to October and Halloween time so I figured we would take a look at a graphic novel based on an unknown killer from the early 1900’s. This killer claimed he was not human and loved the sound of jazz music and would stalk his victims at night, but as quickly as the murders started, they also stopped. I am a true crime buff and always enjoy reading a good novel about an unknown killer, and next to Zodiac Killer and Phantom Killer of Texarkana, The Axeman of New Orleans – this strange case of an unidentified killer – has always peeked my interest. I was curious about who he was and why he did what he did. So for this update we will be taking a look at the information Rick Geary collected to try and bring to life in his graphic novel based on this sadistic brutal killer. So lock your doors and shut your windows as Rotten Ink takes a look at The Axeman who tormented New Orleans. On May 22, 1918 in New Orleans, Italian grocer Joseph Maggio and his wife Catherine were asleep in their bed when The Axeman entered the home, slit their throats with a straight razor and then bashed them in the head with an axe. Catherine’s wound to her neck was so bad that her head was almost severed from her body, while Joseph lived for a short time after his brother found the victims and was able to get him help. On June 27th 1918, the killer struck again when he attacked and nearly killed Louis Besumer and his mistress Harriet Lowe. Both were hit with a hatchet but were found in time by a delivery driver named John Zanca. Sadly, Lowe would later die from surgery linked to her attack, and Besumer would go on to be a suspect in his own attack as well as a German spy and was arrested and died in jail. On August 5th 1918, the killer struck again. This time his victim was a 28 year old pregnant woman who he bashed in the face repeatedly cutting her scalp wide open, and if she hadn’t been found by her husband, she could have bled to death. 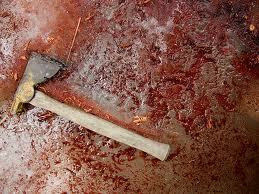 Five days later, the Axeman attacked and murdered Joseph Romano in his home with two ax blows to the head. Romano was found by his two nieces, who were able to get him help, but sadly he died two days later from trauma. Charles Cortimiglia and his wife Rosie and baby daughter Mary were attacked on March 10th 1919. All were hit with an ax, and Mary passed away while Charles and Rosie were treated and released. On March 13th 1919, a letter was sent by the Axe-Man claiming he would not kill anyone who played jazz all night and that he was in fact not human but a demon among many other claims. On August 10th, 1919, Steve Boca was attacked in his home with an ax and was lucky enough to survive. 19 year old Sarah Laumann was found in her home with ax wounds to her head and several of her teeth knocked out; she would survive the attack. The Axe-Man’s final target was Mike Pepitone, who was killed with ax blows to his head. Over the years of his attacks many people were suspects and some were even arrested but none were ever proven to be the real killer. A letter was written by the killer claiming unworldly things, and he was even compared to fictional character Mr. Hyde. One thing is for sure, he was never caught and if he truly was a demon or a monster, he still might be out their waiting to strike again. So there is a quick run down of all the mayhem this killer caused in New Orleans, but his crimes and infamous style of murder also went on to be in many media projects besides this graphic novel. In 1919, a song called The Mysterious Axman’s Jazz (Don’t Scare Me Papa) was written by Joseph John Davilla. 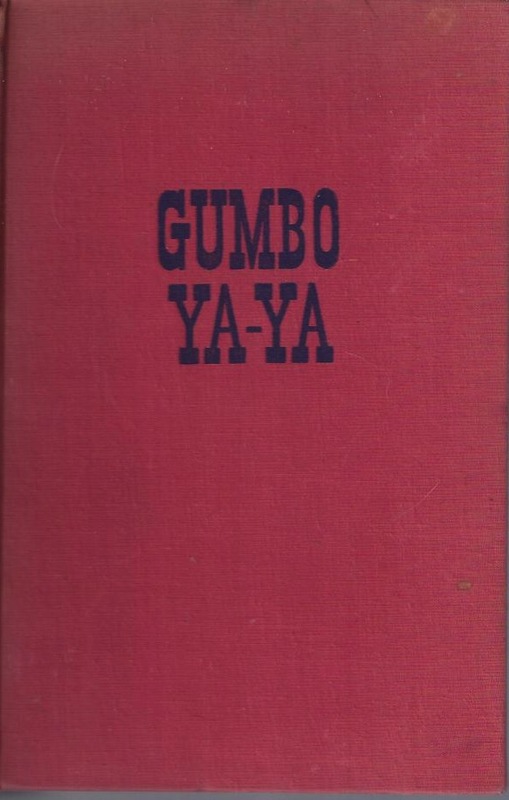 Gumbo Ya-Ya: A Collection Of Louisiana Folk Tales, a book with a chapter about the Axe-Man, was released in 1945. 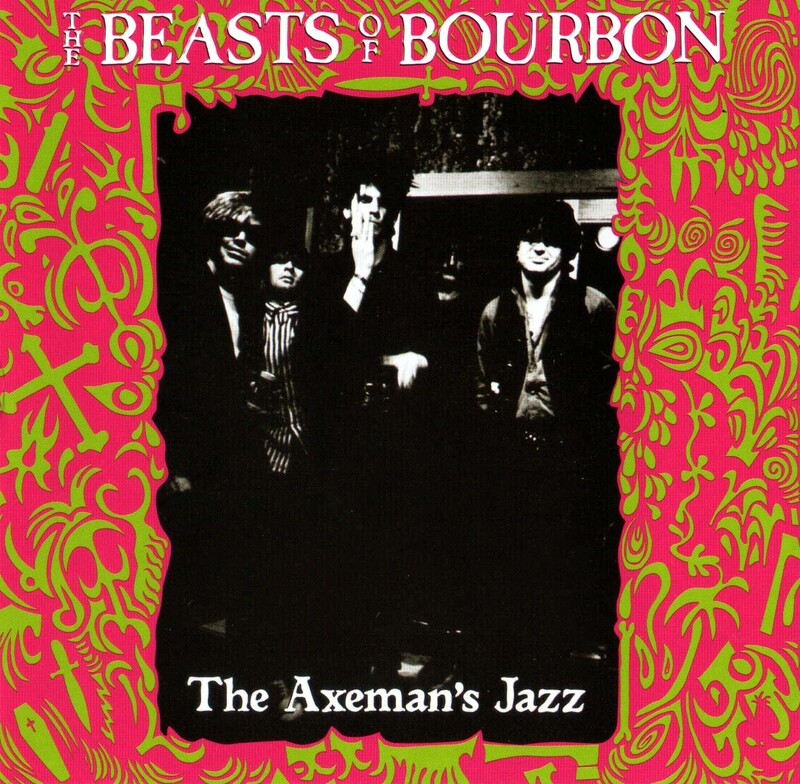 In 1984, The Beasts of Bourdon released their first album called The Axeman’s Jazz after the killer. 1991 saw a fiction novel based on the murders called The Axeman’s Jazz written by Julie Smith. 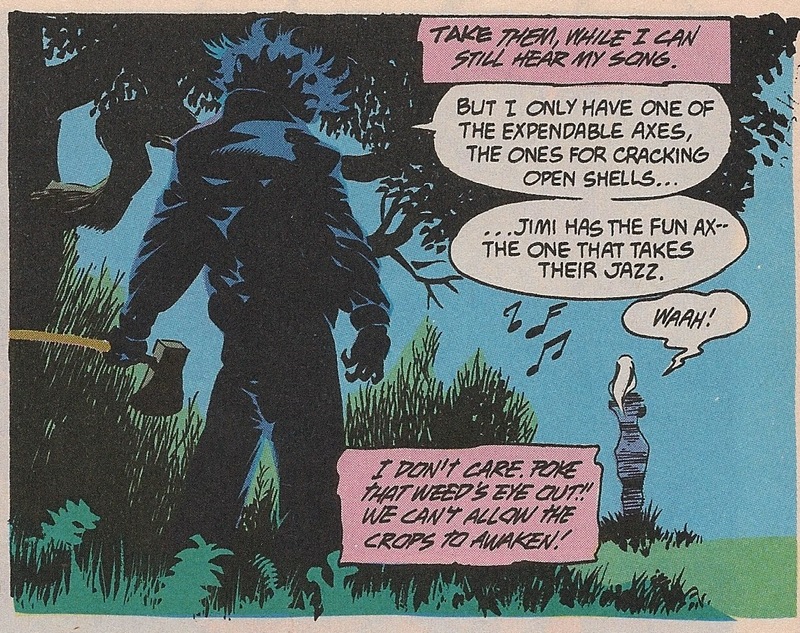 In issue # 94 of Swamp Thing, DC Comics also did a take on the Axeman. 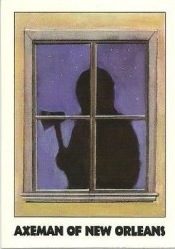 1992 saw the release of True Crime trading cards, and in the second series, The Axeman was a featured card. English band Fila Brazillia used parts of the Axeman’s letter as lyrics in their 1998 song Tunstall And Californian Haddock. 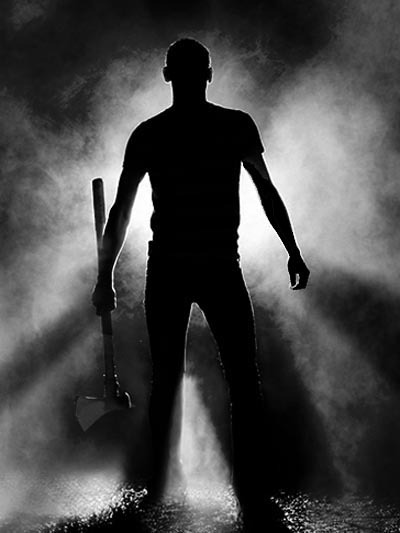 In 2004, I wrote a movie script for Independent B Movie called The Return Of The Axeman that was to take place in modern times and have the killer back, killing college age people on a trip to a rural farmhouse. Sadly, the script was not picked by the group to turn into a movie. Red, White And Blood is a 2012 novel by Christopher Farnsworth that has an evil spirit called the Boogeyman who body jumps into people throughout history and was written to be inside the Axeman during his murders. A year later in 2013, The Axeman, played by Danny Huston, was a character in the TV series American Horror Story: Coven. 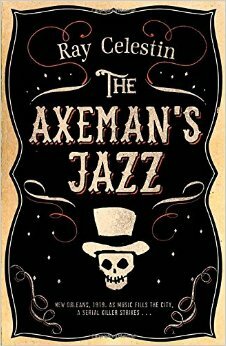 Ray Celestin wrote a fiction detective novel called The Axeman’s Jazz in 2014. And this is just a drop in the hat of the stuff this case has influenced. It’s a shame that the real case never had an ending like all these media projects did as it would have been nice for the killer to have been brought to justice and his victims to have seen their tormentor captured. So as you can see, The Axeman has chopped his way into history as well as in to the comic world as he not only has this graphic novel based on his crimes but also inspired an issue of Swamp Thing! I think it’s time for the main event, and I need to remind you all that I grade these issues on a star scale of 1 to 4 and am looking for how well the comic stays to the source material, its entertainment value and its art and story. So if you’re ready, let’s try to solve this case and see what Rick Geary has in store for us this Halloween update season! The story begins with a history of Louisiana, how it became a state, how New Orleans came about and who it was named after as well as some of the ups and downs throughout the city’s history. It covers the culture that grew in the city from music like blues and jazz to Mardi Gras all the way to the Union holding it during the Civil War and terrors that stalked the nights like Needleman, a chap who injected poison into his victims and even Jack The Clipper, a freak who liked to cut schoolgirls hair in theaters and buses. But our main story starts in 1918 when Andrew awakens to hear thuds and strange noises coming from his brother’s room. Upon checking on him, Andrew finds that his brother is dead as is his wife in what is described at the bloodiest crime scene in the city’s history! A razor was used and found on the bed as was an ax that was left in the bathtub. Nothing was stolen from the house, and the killer got in by using a chisel on the back door’s lower panel and crawling in, and even more oddly, a strange message is left on the sidewalk in chalk that is linked to the crime. Andrew and his other brother Jake are arrested for the murders but are both later cleared of the charges. As one old time police officer remembers, some cases from 1911 that had Italian grocers being killed in this fashion, and the Mafia and a group called The Black Hand became the suspects. More murders and attacks accrue, many with the killer using the victims’ own axes or hatchets to attack them with as well as entering via door panels or open back windows. Many people are accused of the crimes and all are proven not guilty, and the lucky ones who live through the attacks are unable to describe the killer. One case with survivors has the wife accusing another family who runs a store that competes with their own, and it seems as if anyone can be a suspect! Over time people start buying guns, and The Axeman fails at many attempts at breaking into houses. Things seem to go back to normal until he attacks a family and murders an infant child! He then sends a letter to the Times-Picayune on March 14th 1919 stating he is a demon who chooses to kill whenever he wants and that he will strike on the following Tuesday and will murder anyone who is not playing jazz as he is very fond of that style of music. All over town that night jazz music echoes, and the killer does not strike. The Axeman strikes once again in 1919 but also during this year he is run off by aware townspeople who react and scare away the killer before he can claim a life. And after killing a total of six people and wounding six others, the killings just stop, and The Axeman fades away into the shadows and memories of New Orleans. On December 2nd 1920, a man named Joseph Mumphre was shot and killed on a sidewalk in Los Angeles by Rose Pepitone, who was the wife of the Axeman’s final victim. She claims that Joseph was the Axeman and that she wanted nothing but revenge on him for killing her husband; others don’t think this was the case at all. So ends the story of The Axeman who could have died a man or lives on as a demon roaming the world looking for his next time to strike terror. This graphic novel is a well-done true crime spectacular that will wrap you up into trying to figure out who was the Axe-Man of New Orleans and also lets you look at the horrific crimes he committed in glorious black and white art. The comic covers a very brief history of Louisiana and New Orleans and then goes into the horrific acts committed by the Axeman and gives you dates and facts about each crime and even a little history about the poor victims. While it’s about a brutal killer, this graphic novel does not go overboard on the blood and gore, but that’s not to say that the red stuff don’t flow from wounds nor splatter walls cause it does, just very tastefully. The interesting part about this is that in 1911, years before the official Axeman attacks, horrific murders with the same M.O. were committed showing that this killer could have had even more victims than reported, and it also brings light to the fact someone in New Orleans really disliked Italian grocers. 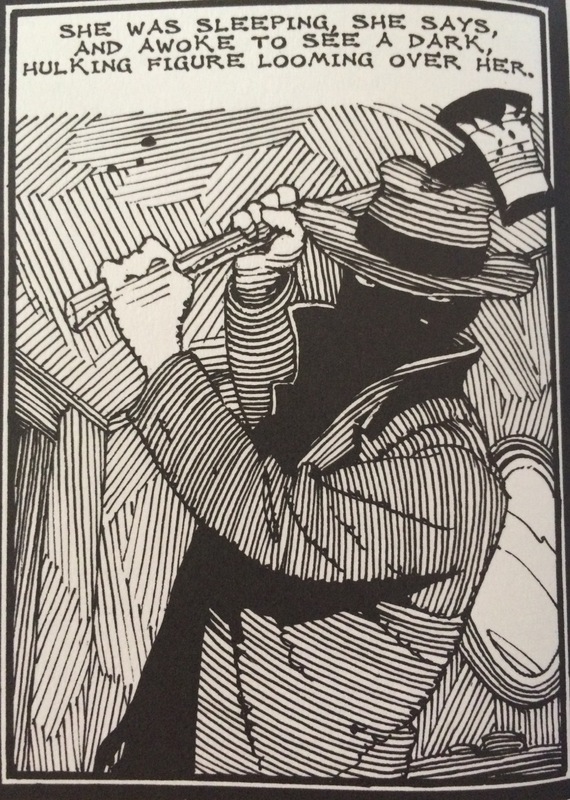 But the million dollar question that this graphic novel really gets you thinking about is who was The Axeman as the suspects are plenty and almost all of them at some time were ruled out even if they had motive to commit the murders. Plus the thought of several murderers all doing the crimes to look like one also comes to my mind when reading it. But I really do think the main suspect, and probably the man who was the Axeman of New Orleans, was Joseph Mumphre. When he was in jail, the killings stopped for a brief time, and then once he moved away to L.A. the killing were done. This is clearly the main suspect and the right one for the police to have kept an eye on even though they didn’t, and it took the widow of one of the victims to give him justice at the end of a bullet. Rick Geary’s artwork is fantastic and captures the mood and feel of this grim subject and brings a touch of class to such a horrible crime in American history. If you’re a comic book fan and love true crime, this is a great read on a late fall night, really worth checking out. After reading this one, I ordered more of his work, and I am sure you will see them pop up here on Rotten Ink as future updates. Below is some art from this graphic novel of the Axeman, so sit back and give it a look, and you also might want to look over your shoulder because who knows, he might still be out there! 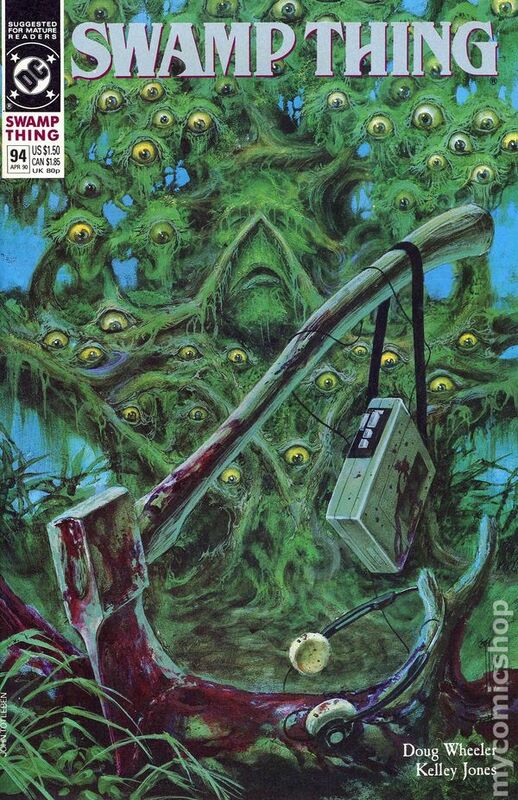 We finished this a little early, and I know you want to be scared a little more from this Pre-Halloween update so we will take a look at Swamp Thing # 94! I have been a fan of Swamp Thing for many years, and when I was a kid I had The Saga Of Swamp Thing # 1 comic and thought I had a true collectors item…now being 36 and a comic store connoisseur, I see that that issue is not worth the thousands of dollars I thought it would be when I was that comic collecting youth. Also, thanks Lone Star Comics for having this in stock so that I could cover this issue for this update! The Axeman is back and has killed in the small town of Houma during Mardi Gras leaving the bodies in the swamp where they are found by Swamp Thing. In town is a jazz band named Cocodrie whose lead singer has gotten an ax from a fan that holds magical powers of music for every blood drop on it. This ax really came from a descendent of the original Axeman of New Orleans who wants the legacy of the killings and the spreading of jazz music to continue. Abby Holland, the wife of Swamp Thing, wants him to come to the big concert tonight as she thinks no one will notice him as everyone will be in costume and too drunk to care. All the while murders are happing, and the new Axeman is collecting blood and setting jazz music free from the hearts of his victims. You see, while the singer plays the jazz, the killer does his thing and murders poor people in their homes. The killer is being pushed by a giant purple demon who is getting joy of the madness and terror these killings are causing. While at the concert Abby has to leave as her baby daughter starts to cry because the infant can see the demon. This makes them the target of the Axeman, and just as he is about to chop them up, Swamp Thing appears and beats not only the killer but also the demon. This marks the end of the terror of the Axeman as even the band’s singer is effected by the defeat. 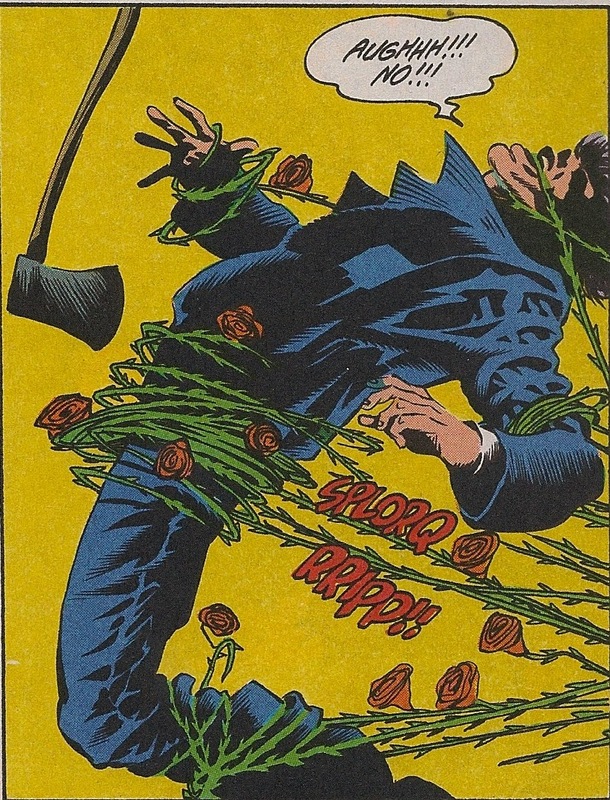 This issue while good is a disappointment and clearly a filler issue in this series as both Swamp Thing and The Axeman of New Orleans are after thoughts to the demon who is the cause of the murders as well as the lead singer of Cocodrie and his love for his musical ax and wanting to be the top jazz musician in the world. The plot is this a demon who us the man behind making a man become an ax murder is back and is using a new batch of goons to commit the crimes is stopped once Swamp Thing gets wind of what’s going down and saves his wife who was the next target to be chopped up. Swamp Thing in this issue is disgusted by the murders and wants to seek answers to what kind of demon could be pushing a person to do these acts, he also takes no mercy on how quick he takes down The Axeman! Abby Holland is a free spirited woman who loves her family and also loves running around the swamp naked and trying to get Swamp Thing to do normal activities. The Axeman has two different types of axes one for killing and one for making music and when he kills he wants to be a brutal as possible and targets many woman this time around, really like how the killer is related to the original axeman and that a demon is really calling the shots just as the letter stated back in 1919. The Cocodrie are used a filler to help spread Jazz music and the lead singer is the pawn in a sick game of promised fame and fortune, I mean who ever has heard of a magical musical wood chopping ax? The issue has some horror elements as people are chopped up and a Demon jumps for joy when people are killed, the downside is the story is weak and has a lame pay off with Swamp Thing stopping the Axeman with ease and at no point is he or Abby really in any danger! The major plus side to the issue is that they use the song The Mysterious Axman’s Jazz (Don’t Scare Me Papa) as the motivation of the killer and his musical butthead lacky. 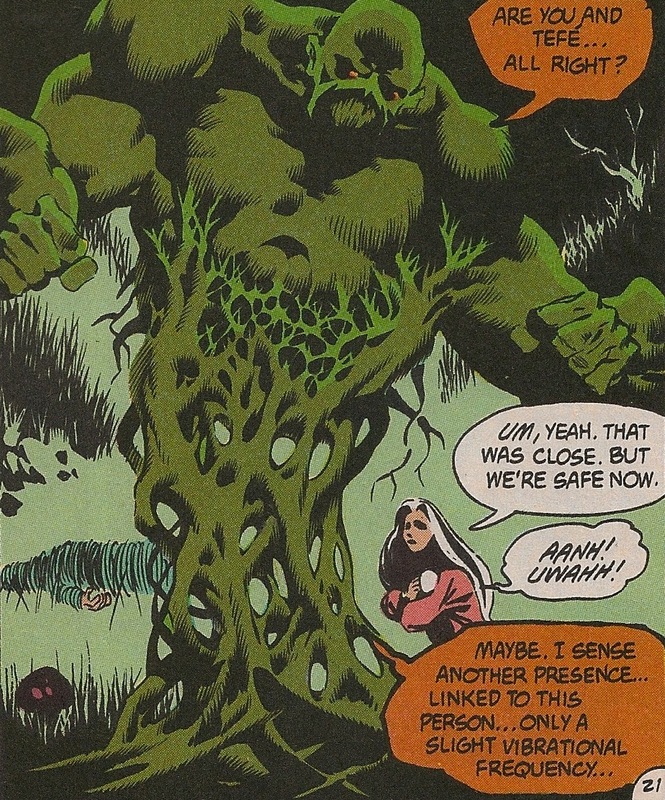 The artwork is done by Kelley Jones and the story is done by Doug Wheeler and while a little lacking they both are fitting for this Swamp Thing filler issue. Over all I am a Swamp Thing fan I just was let down by this issue and I think it might have been my own fault as I might have over hyped it in my head. 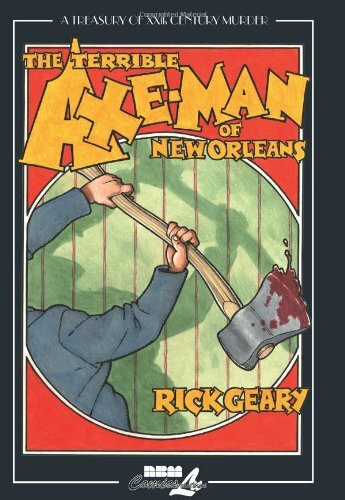 So this Halloween season while zombies, vampires and werewolves might scare you late nights in movies, comics, video games and novels know that the real horrors of the world are people like The Axeman of New Orleans who stalk the innocent to satisfy their sick bloodlust! Our next update I am very happy to say that the first update for October is going to be Panic Beats another very cool comic based on a Paul Naschy film! So until then watch a horror film or two, read a horror comic or three and support your local Horror Host as this time of the year is made for having a good scare or two.